Colombia’s rich food culture is a harmonious blend of Spanish influence, with the indigenous plethora of ingredients from the Pacific Ocean to the west, the Caribbean Sea to the north, and the biodiverse regions of the Andes Mountains and the Amazon rainforest. 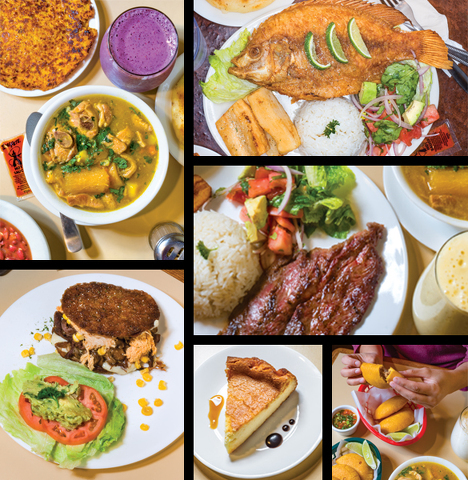 The secret is out – Colombian cuisine has finally arrived in State College at El Gloton. Bring your appetite, grab a bottle of aguardiente, Colombia’s national drink, and get ready for a feast. Operating out of the Bagel Crust Café at 460 Westerly Parkway, El Gloton serves a taste of Latin America on Friday and Saturday nights, 5:30-9:30 p.m.
Don’t be deterred by the menu, which is written in Spanish; someone will be happy to translate and suggest dishes to try. Come with an adventurous spirit, ready to sample some beef or chicken empanadas, a handmade arepa filled with cheese, or a bowl of ajiaco, a hearty soup of chicken and potatoes popular in Bogota, the capital of Colombia. El Gloton translates literally to “the glutton” or “the one who eats a lot,” and guests will be pleasantly satisfied with the healthy portions of arroz con pollo (chicken with rice), carne de bistec (grilled steak), or lomo de cerdo, (grilled pork), all served with a choice of yucca or fried green plantain and a house salad. A native of Colombia, Bagel Crust Café owner Al Rusinque and his family moved to the United States more than 20 years ago. He craved the flavors that reminded him of his birthplace, but there were few options serving authentic Latin American food. His sister Karen decided to cook the whole family a traditional Colombian holiday feast one Christmas. Al was very impressed, but he wasn’t sure if State College was ready for a Colombian restaurant. Taking advantage of his bagel shop’s kitchen and dining space, he took a chance to see if diners were open to try something different. As a family-run business, everyone pitches in to help translate the menu for guests, take orders, and serve the dishes. Nicholas and his siblings George and Juanita were happily waiting on tables on a recent Saturday night, careful to stay out of the kitchen while their mother was cooking. “There will be issues if we go into the kitchen when our mother is cooking,” Nicholas says with a chuckle. In the coming months, El Gloton is hoping to expand, open on other weekday evenings, offer more dishes, and provide diners with a menu in English with pictures of each item. For more information, check out the restaurant’s Facebook page at bcclatinofood or its website, bccelgloton.com. For reservations or to place a pickup order, call (814) 308-9321.